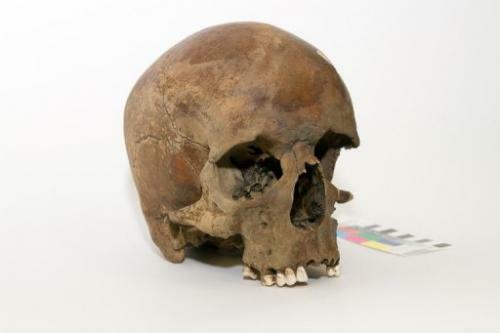 A centuries-old skull found in northern New South Wales in late 2011, in Canberra. The skull of a white man is raising questions about whether Captain James Cook really was the first European to land on the country's east coast. The centuries-old skull of a white man found in Australia is raising questions about whether Captain James Cook really was the first European to land on the country's east coast. The skull was found in northern New South Wales in late 2011, and police initially prepared themselves for a gruesome murder investigation. But scientific testing revealed that not only was it much older than expected, but possibly belonged to a white man born around 1650, well before Englishman Cook reached the eastern seaboard on the Endeavour in 1770. "The DNA determined the skull was a male," Detective Sergeant John Williamson told The Daily Telegraph. "And the anthropologist report states the skull is that of a Caucasoid aged anywhere from 28 to 65." Australian National University expert Stewart Fallon, who carbon-dated the skull, pulling some collagen from the bone as well as the enamel on a tooth, said he was at first shocked at the age of the relic. "We didn't know how old this one was, we assumed at first that it was going to be a very young sample," he told AFP. "When we first did it we weren't really thinking about people coming to Australia and things like until we started to look at the dates and say, 'Oh, that's becoming intriguing'." Australian National University's Dr Stewart Fallon holds a skull found in northern New South Wales in late 2011, in Canberra, July 1, 2013. He said the test used was quite accurate for dates after 1950 but for earlier samples it was more difficult, and the two samples yielded different dates—though both were within the error range. "Using them (the dates) together we can do some modelling as to what we expect the calendar age to be ... and the way it works out by using those two dates is that we get about an 80 percent probability that the person was born somewhere around the 1650s and died somewhere between 1660 and 1700," Fallon said. He said there was a 20 percent probability the skull, which was found well-preserved and intact but without any other remains near the Manning River, belonged to someone born between 1780 to 1790 who died between 1805 and 1810. "Before we rewrite the history of European settlement we have to consider a number of issues, particularly the circumstances of the discovery," archaeologist Adam Ford told the Telegraph. "The fact the skull is in good condition and found alone could easily point to it coming from a private collection and skulls were very popular with collectors in the 19th century." Cassie Mercer, editor of Australia And New Zealand Inside History, said the skull "could be an incredible find". "I guess it's a very exciting find because it could open up a whole lot of avenues of history that we haven't been able to explore before," she told AFP. Dutch explorers made the earliest European landings in Cape York in Australia's far north and western Australia in the 1600s.